A new leak has been released by website VGleaks, that shows the Xbox 720 CPU specs and how the central processing unit is set out. The big Sony PlayStation 4 event knocked the Xbox 720 off the grid, with users almost forgetting that the Microsoft launch event is just around the corner and no doubt Redmond are working even harder to get their next generation console ready to preview. The Xbox 720 CPU is what you would expect from a next generation console, a lot larger than the one of the Xbox 360 and impeccably simpler to the PlayStation 4 CPU. 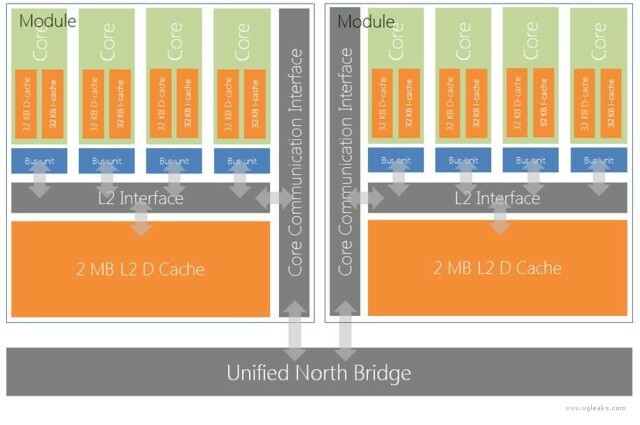 The CPU will be made up of two modules, each with four cores inside. Surprisingly, the cores are clocked at only 1.6Ghz speed, quite a low performer for a gaming console trying to beat the latest mid-tier gaming PCs. This speed is actually half of what is in the Xbox 360, with the latest console core running at 3.2GHz. This will not stop the Xbox 720 CPU running a lot faster than the Xbox 360, with the multicore split, extra cache and hopefully better graphics card. The CPU is apparently being made by AMD and will exclusively be built for the Xbox 720. While this does look like a good amount of cores and an excellent design setup, made to cater more for gaming and caching certain areas for quick render quality, it doesn’t really blast through the Sony PS4 CPU architecture. We suspect that both next generation CPU’s will allow developers to add some pretty amazing 3D features to their games and engines. We have already seen what some developers are adding with the PS4 event. Microsoft has yet to actually announce any information regarding the Xbox 720, or “Durango” as it is still being called. With all these latest rumours and leaks regarding the Xbox 720, there is no doubt that somewhere, engineers are working on the next Xbox, ready to compete with Sony. Addit: the Xbox 720 is here and it’s called the Xbox One.